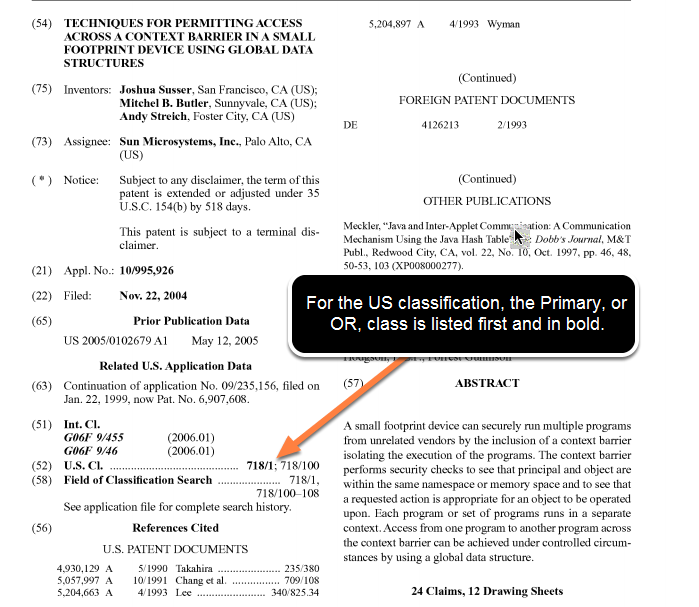 The primary US class appears first on the patent. It is in bold text, and it is supposed to best represent the "inventive step" of the invention. To find patents that are classified by the primary class, use the PCCL field code. The primary classification is in contrast to the cross-reference (XR) classification(s). You may hear the term Original classification or OR bantered around by patent examiners. This is the USPTO's internal jargon for the primary class. It is called original because when an application is received by the USPTO, the first action is to classify it (by the Classification Group--a contracted vendor). The PTO uses this original class to route the patent to the proper examination art unit. Note: The CCL field code returns patents classified by either the primary or the cross reference (XR) classes. PCCL:701 --> Returns all patents classified in class 701. PCCL:701/100 --> Returns all patents classified in, and only in, 701/100. To search for patents by their primary (inventive step) classes AND include children, use the PSCLS field code.